Structural repetition in US-American avant-garde and experimental music around 1950 was considered a taboo: Cageian open forms as well as serial twelve-tone rows clearly forbade it. 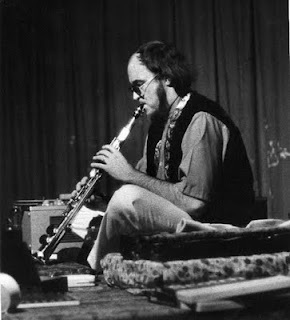 A radical gesture can be found in La Monte Young’s Fluxus-influenced X for Henry Flint (1960), but the kind of repetition used in it cannot be considered a proper compositional technique. It was Terry Riley who started to work with looping and delay techniques offered by the tape recorder, first present in the tape collage Mescalin Mix (1961). At the same period he also experimented with new forms of assembling recorded material that anticipates the practice of remix (Music for “The Gift”). With In C (1964), these techniques are transferred to the instrumental work, an abstract move between two ontologically distinct realms: the mechanical and the instrumental. Its impact is integral to the understanding of the later American musical minimalism, including the works of Steve Reich and Philip Glass. In his illustrated and sonorous presentation (in English), Johan Girard shows Riley’s pioneering and the further development of the use of repetition in experimental music after him. Johan Girard (Paris) is a researcher in the field of musical aesthetics and communication studies as well as a composer in the avant-pop group Dorian Pimpernel. He will publish a book about Riley, Reich and Glass at the beginning of 2010 (La Répétition des répétitifs, Presses de la Sorbonne Nouvelle). The presentation is part of the series "Forum KK" for research in art and culture, directed by Michael Hiltbrunner, at the Corner College Zurich in cooperation with the Swiss Society for Cultural Studies (SGKW).